Commissioned by the IKON Gallery, Birmingham UK. This 5-channel video is based on the original 30 day performance that took place daily between 8:45 am & 9:00 am at Central Tech High School in downtown Toronto. 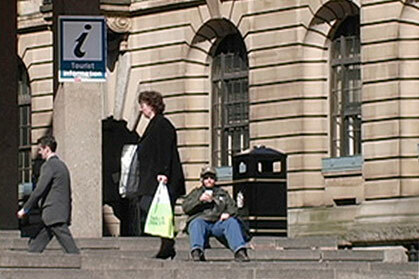 I was invited by at the Ikon Gallery in Birmingham England to recreate this work in the UK. I performed the exact same set of movements as the original Hiccup piece on a set of similar concrete stairs in a very busy public area in downtown Birmingham. For this version I chose to do it between 12:00 & 12:15 pm during lunch hour from Monday to Friday.